The theme of this catalog was “The Art of Igloo.” The source painting, which was commissioned and executed in the style of the Dutch Masters, showed the executives of Igloo. 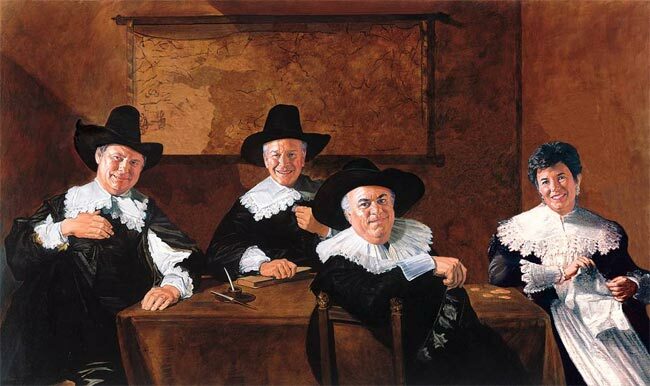 The client needed to show more executives that did not fit into the main painting, which resulted in the edited composition – I removed several people from the first painting; one of the executives was a woman, so the art director chose a period-appropriate painting of a woman for her body. The source chrome for the woman’s body was dark and needed a lot of work to pull out the detail.